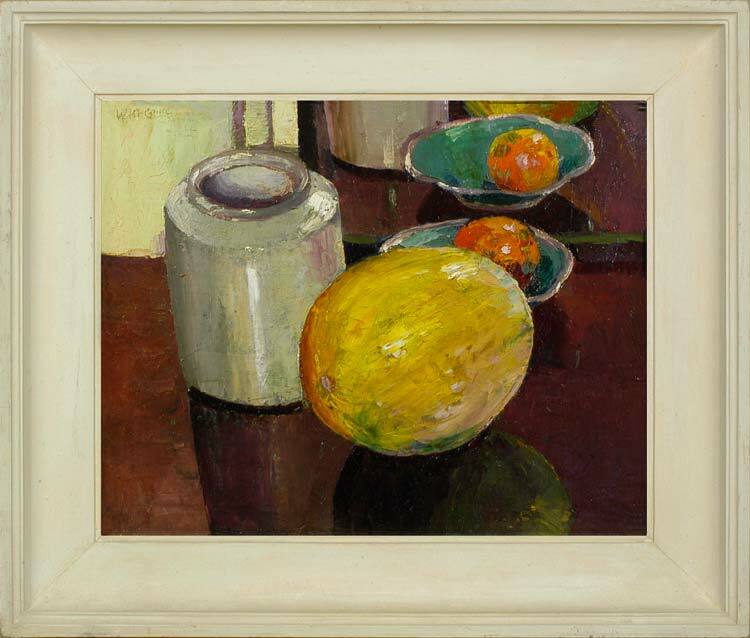 This still life was included in both McCance’s first solo exhibition, in Reading Art Gallery, and in the major retrospective of his work which was shown in Dundee, Edinburgh and Glasgow in 1975. It is characteristic of his use of colour: saturated, rich and descriptive, laid on in a voluptuous impasto which caresses the surfaces of the various objects. The use of the palette knife gives an almost sculptural sense of solidity and volume to the glazed jar and the melon. This is a relatively early work in the same realist style as the 1919 painting, Kimono study, of his wife Agnes, and shows the same delight in patterns of vibrant colour across the picture surface. Although small, it is complex in its articulation of space, and also of reflections (in the polished table-top and the looking-glass behind, including in the latter a reflection of a reflection). William McCance was born in Cambuslang near Glasgow in 1894 and attended Glasgow School of Art from 1911-15. He was imprisoned as a conscientious objector during the First World War, and moved to London in 1920. This move had a profound effect upon his style, introducing him to the work of the Vorticists (notably Wyndham Lewis). He began to produce paintings which veered towards abstraction, and which, like those of the Vorticists themselves, were influenced by the Italian Futurists. The latter portrayed the speed of contemporary machines, whilst the Vorticists celebrated their energy and potential. McCance (unusually for a Scottish artist) can be seen as producing work very much in this modernist spirit, in paintings such as Heavy structures in a landscape setting. He was also influenced by William Roberts, who was his lodger, and had been at nineteen a founding member of the Vorticists. McCance’s early works are considered his most successful; later on he flirted with Fauvism and pointillism. McCance’s wife, Agnes Miller Parker, was a wood engraver, and he himself executed a number of linocuts and lithographs; these interests led to his work in the 1930s as controller of the Gregynog Press in Wales, which produced limited-edition books set and illustrated by notable British craftsmen. He was also a talented sculptor, and his bronzes of cats are immaculately observed and timeless pieces. In 1960 he had his first solo exhibition, in Reading Art Gallery; in 1975 this was followed by a retrospective show in Dundee, Edinburgh and Glasgow. His great-nephew and pupil, Rod McCance (1950-), is also a professional artist. Works in public collections include Heavy structures in a landscape setting (National Galleries of Scotland).